Catherine (Minerd) Barnhouse was born on Feb. 28, 1824 at Hexebarger, near Kingwood, Somerset County, PA, the youngest daughter of Jacob and Catherine (Younkin) Minerd Jr. She had blue eyes and light brown hair. On May 27, 1849, at the age of 25, Catherine married 20-year-old Harrison Barnhouse (1829-1875), the son of William and Mary (Schneider) Barnhouse. Harrison was five years younger than Catherine. The ceremony was performed by Rev. John Hickernell, a leader in the Church of God movement of the 19th century, and the pastor of what's now the Old Bethel Church of God. Shortly after marriage, the Barnhouses moved to near Normalville, Fayette County, PA. Their children were Clarissa "Clara" Huston, John Resler Barnhouse, Esther Resler Freed, Susan Stoner, William Marcy Barnhouse and Sarah Jane Barnhouse. Of their six children, three died young -- John in about 1852, Sarah in 1862 and William in 1874. Catherine received a set of six iron spoons as a wedding gift. The precious spoons have been handed down in many generations of the family as heirlooms and have traveled to many towns along the way in Western Pennsylvania. Today they are displayed in the homes of great-granddaughters. One of the iron spoons Catherine received as a wedding gift in 1849. It measures 4 and 7/8 inches in length. ... has erected a neat little cottage near East Liberty, on the property known as the "Dickerson Run oil property." Harry is a sober, upright, industrious man, and we are glad to report that he has been able to acquire a home of his own. He is one of those that can heartily subscribe to the good old moth, "Democratic at all times and under all circumstances". At the coke ovens, Harrison often would have worked in poses such as the rare postcard image seen here -- loading and unloading tons upon tons of coke from the hot, gassy ovens in preparation for their shipment to the Carnegie Steel mills in Pittsburgh. 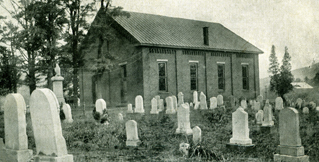 The Barnhouses were active in the Cumberland Presbyterian Church at Dickerson Run. (Today it's known as the East Liberty Presbyterian Church near Vanderbilt.) Harrison was elected superintendent of the church Sunday School in 1871 and served as a delegate to the Fayette County Sabbath School Union in 1873. He and daughter Esther were delegates in 1874 to the 8th Annual Convention, the year before he died. They are memorialized on the church's website. Harrison also was active in the Knights of Pythias -- and a fellow member was his wife's cousin in law, Henry "Foxy" McKnight. Foxy later helped bury Harrison, and was named to collect a $50 debt against the Barnhouse estate. In 1871, the Barnhouses celebrated the marriage of their daughter Clara to Boyd W. Huston, knowing full well that the newlyweds were planning to leave the area and relocate in eastern Kansas. Later that year, the Hustons boarded a boat in Pittsburgh and traveled to Kansas City via the Ohio, Mississippi and Missouri Rivers. 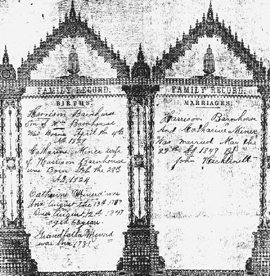 A page from the old family Bible is seen here, containing birth and marriage information for Catherine and Harrison, as well as some key dates for Catherine's parents, Jacob and Catherine (Younkin) Minerd Jr. The last year of Harrison's life was difficult emotionally, physically and financially. On June 25, 1874, the Genius reported that he "...had his hand mashed whilst coupling cars. Dr. John R. Nickel was called and three of his fingers were amputated." On Aug. 11, 1874, tragedy struck again when their 18-year-old son William suddenly died, of causes yet unknown. ...was always respected and honored by all whom knew him. By hard and persistent labor he attained enough of this world's goods to purchase for himself a small property adjacent to East Liberty, on which he lived for several years; but a little more than a year ago afflictions came upon him, which necessitated him to renewed exertions to cancel heavy physicians' bills, etc. Last fall he again moved to the coal works, that he might the better accomplish his object. But a few days ago he was stricken down with that terrible disease, Typhoid fever, which soon did its dreadful work... Peace to his ashes." News of his death was telegraphed to his married daughter Clara Huston, now living in Spring Hill, KS. Traveling home, she "arrived on the 6 o'clock train at Dawson ... to attend the burial," said the Genius. To help cover enormous medical bills, Harrison's estate was auctioned off, and raised $59. Son in law Jesse Stoner bought an axe, coal scuttle, iron kettle, dough tray, palings, corn popper, lard can, clothes basket, boards and posts, and crocks. Son in law Christian Freed bought a tub, planes, hoes, a spade, hand saw, rake, stove pans, lantern, clothes brush, dishes, flat irons and crocks. Among the Barnhouse debts was for large quantities of beef purchased on credit from the Brown, Oglevee & Co. store at the Jimtown Mines in Dawson. A statement of the Barnhouses' credit account from the store is seen here. The following year, Catherine died of "pulmonary trouble" at East Liberty, on July 28, 1876, at age 52. She was buried at "Alexandria," PA, but her and Harrison's graves have not been located. Nearly 40 years after their deaths, in 1913, daughter Esther was elected treasurer of the 1st Minerd Reunion. She and her husband also attended the 1920 Minerd Reunion at Ohiopyle, Fayette County, and perhaps others over the years.